Study Coastal Archaeology, Historical Ecology, and Indigneous Hertiage in a National Park Reserve. Costs: In addition to your tution and registration fees there are field school fees. UVic Anthropology portion: $700 for UVic students and $900 for non-UVic students. Payments may be mailed to the Anthropology office (see the contact page of this site) or dropped off personally M-F 8:30am-4:00pm. Payment options are: cash, personal cheque or a bank cheque/money order in Canadian dollars only. Call 250-721-7046 if you have a question. Bamfield portion: $1400 plus application fee. See Bamfield's site for payment procedures. *Applications for the Social Sciences Support Fund are due no later than one week after you have been notified of your acceptance to the field school. However, their notification of whether you receive the funds may take another week. Not a current UVic student? Here is the information to help you proceed. Notification of acceptance: Applicants have been notified and a waitlist has been established. Visit the field school blog, read a 2016 story in The Ring or watch this video. Dates: Segments of the field school. 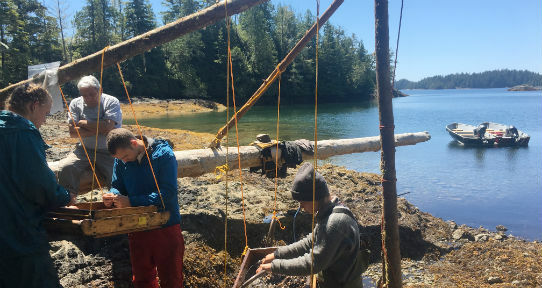 Description: The Department of Anthropology at UVic is running an archaeology field school in Nuu-chah-nulth First Nation territories on western Vancouver Island as part of two 1.5-credit courses (ANTH 343 & 344). The first four days of the field school will be based in Victoria followed by two and a half weeks of remote camp-based fieldwork in Tseshaht First Nation territories in the Broken Group Islands in Pacific Rim National Park Reserve. The final 3-weeks of the course will be spent in Huu-ay-aht First Nation territory at the Bamfield Marine Sciences Centre (a UVic supported teaching and research facility in Barkley Sound) where students will conduct laboratory analyses and prepare written research reports on recovered archaeological material. This course will be an immersive 6-week field experience (including hiking, camping, and boat travel) and require full days and dedicated teamwork. Academic Credit: ANTH 343 -1.5 credits (July 1-21) and ANTH 344 - 1.5 credits (July 21-August 9) for a total of 3 UVic credits. Application and enrollment in both courses is mandatory for UVic anthropology students (i.e., it is not possible to enroll in only half of the field school). Prerequisites are ANTH 240 and permission of the instructor.